I have recently been reminded about a lesson I learned long ago through an experience that my sister and I went through in the last year. The lesson is if a horse changes his behavior, he does it for a reason. Sometimes we have trouble figuring out the reason, and sometimes we never figure it out, but there is always a reason. They don't just decide to change randomly. Our job is to find the reason, and if the change is negative, try to fix the problem. We have had all our horses for quite a while, and we know them very well. Late last summer, as the weather got cooler, our horses started to change. We attributed it to the weather. 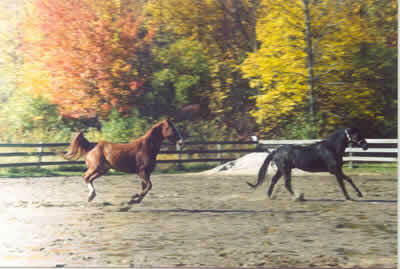 Horses usually get more energy in cooler weather. In years past, they were pretty good in the fall, though, and would only be difficult in the spring when they would first start trail riding again. We thought maybe they were acting so hyper because we were in a new barn that year. It was a fairly boring place for them. They didn't have windows to look out, it was dark and there wasn't much activity for them to watch. Maybe they were acting up because they were bored. As the weather got colder, they just got worse. Cruiser, my Morab, wouldn't settle down on the trail, and it took him a long time to start paying attention to me in the arena. Ranger was spooking more than ever-even in the arena. My sister ended up falling off in there for a spook caused by nothing. Even my quiet Mingo was spooking. He is the one who changed the most. He started bucking occasionally on the trail and in the arena. Poor Kevin, my boy friend who leases him, was Mingo's biggest victim. Mingo learned he could break free from Kevin if he was being led in the arena and run around like crazy. This was really odd. He tried it a few times with me, unsuccessfully, and then he quit, but since he had succeeded with Kevin a couple times, he was much more persistent with him. We spent a few weeks retraining him to lead last winter. We also had to retrain him to stand while being mounted. This is something he knew quite well, also. Why did we have to go through it again a few years later? Oh, there were other things, too. Mingo went through a phase of freaking out in the crossties. Ranger, my sister's horse, wouldn't let people catch him in his stall. Supposedly Mingo was kicking and biting the barn owners when they were cleaning the stalls-something he never did in the past or since. 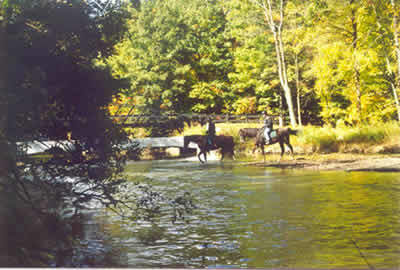 Come springtime, when the river thawed out and we were able to start real trail riding again, were we in for a surprise. Mingo was doing some serious bucking. Ranger and Cruiser behaved awful together. I was getting blisters on my hands trying to slow and stop Cruiser. Ranger threw temper tantrums if Cruiser was ahead of him and he wanted to be in the lead. If we rode alone, we were fine; they would go pretty fast, but we could control them. It was getting to the point that my sister and I only wanted to walk when we rode together. We would turn them out to play before the ride so they could get their silliness out, and that helped to a certain extent, but we didn't always have enough time to do that. We were getting exasperated. Keep in mind, these aren't horses ridden once a week. They are ridden at least 4 times each week, and we like to do a lot of trotting and cantering. Mingo is only 6, but the other two are 14, so they didn't have age as an excuse, either. Come April, Mingo apparently got so bad when they were cleaning his stall, that we were told we had to move him. Of course, we decided to move all the horses. A week before we were going to move, I checked the barn owner's feeding chart to see exactly what they were getting. They had all put on a little weight, and I even had to switch saddles on Cruiser because the one I was using started to leave rub marks. We figured we would tell the new barn owner to feed them a little less. Much to our surprise, they were getting 50% more food than we originally told the old barn owner to give them1 ½ years before when we first moved there! We never made the connection between that and their new personalities. Everything fell into place. Our theory was that when she saw how much we rode the summer before, she decided our horses needed more food, and increased it late last summer when we first noticed they were getting hyper. To test our theory, when we got to the new place, we told the owner to feed them what they should have been receiving all along. Within a week, we had our old horses back. We now clean our own stalls, and Mingo has not once even threatened to kick or bite. They are quiet and obedient most of the time and a pleasure to ride again. Here is a different story on a related note I heard from talking to a woman I was riding with a few days ago. She has a very nice Thoroughbred mare that she rides nearly every day. Gradually, her mare started to get fractious. On the way home, she would dance about. She was reluctant to leave the barn; even balking in the driveway. It kept getting worse and worse. Knowing that the change in behavior had to be caused by something, her owner spent some time thinking about what could possibly be causing it. Since she rides so much, she had decided to give her mare some extra oats each day she rode to supplement her feed the she normally received. Her mistake was giving her the oats when she got back from her ride. Her mare was so fixated on the oats that she would receive when her trail ride was over, that it made her reluctant to leave and eager to get home. Her owner decided to give her the oats before the ride (with ample time to digest, of course.) Within a few days, her horse started acting like her old self. Our horses are always telling us things. All we have to do is listen and try to understand. If they act different, it is always for a reason. Sometimes we have to play detective, but the answers are there if we look hard enough.